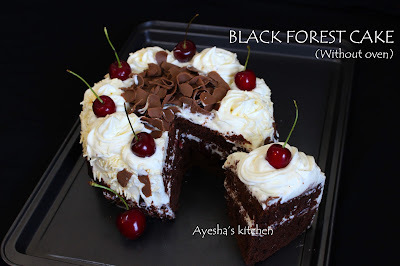 Hi, foodies...here is your favorite black forest cake recipe. This super moist chocolate cake is baked without an oven. Yes, an oven is not at all needed to make the best cake of your life. This is the recipe which is requested by many viewers of my page. I already made a carrot cake without an oven which was my first attempt at stove top baking. 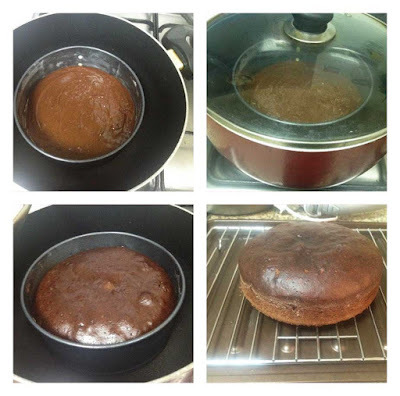 One thing i should say that stove top baked cake is moister and looks good when compared to oven baked cakes. Speaking of my black forest cake....it's chocolaty, creamy, super moist, cherry(ish) with some bites of chocolate shavings. Here frosting is made with whipping powder. 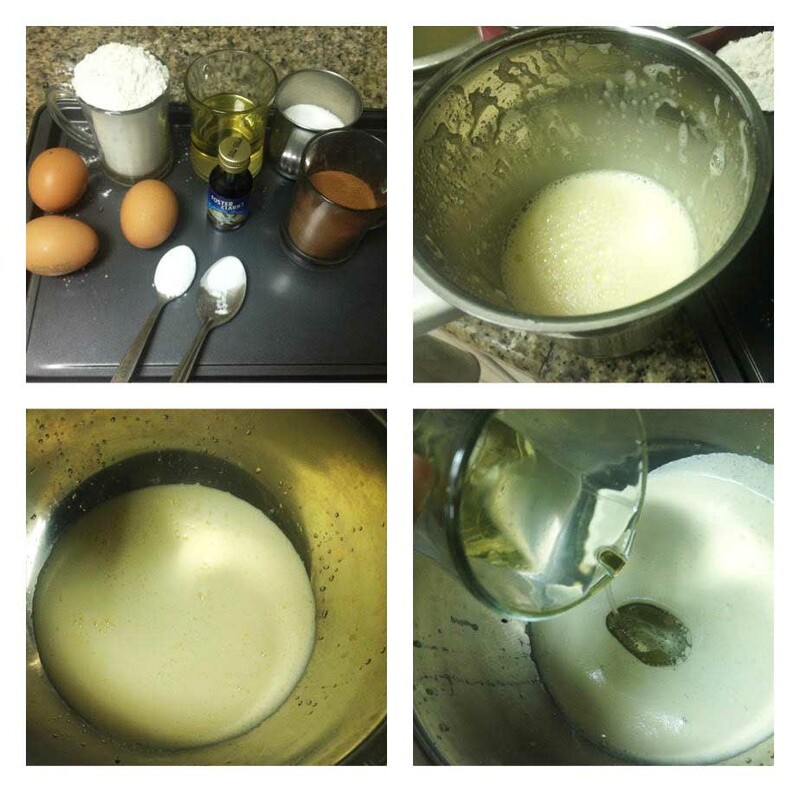 You can also use heavy whipping cream which gives more stiffness. You can check my vanilla chocolate cake frosting recipe for whipping with heavy cream. For the best taste, you must chill your cake before serving. In my opinion, when chilled, the taste enhances with an intense flavor of cherry and over all, it tastes delicious when chilled overnight. So if u love cakes..try it at home. No matter whether you have an oven or not. Sure, you won't go for bakeries for cakes once you try this recipe. 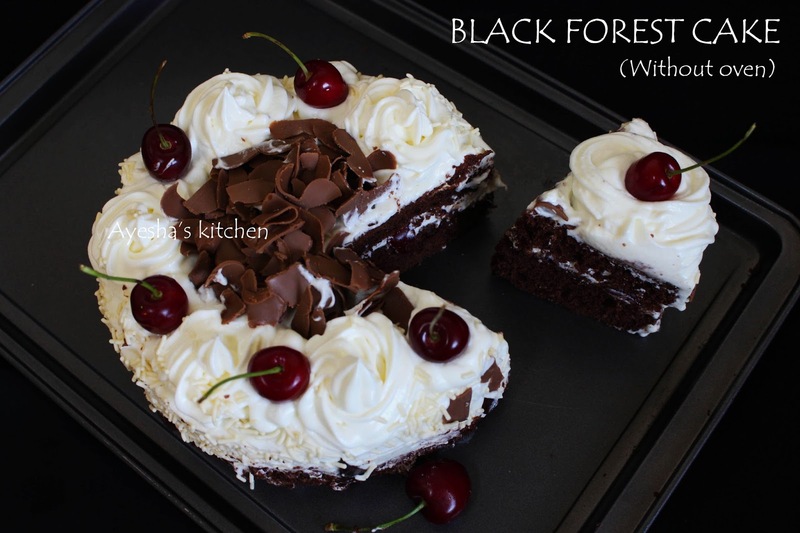 Black forest cake is very popular among people. Nowadays, black forest and white forest cakes are the attraction of any parties or functions, especially for birthday or wedding. People think it's very difficult to make at home. No...it is not. 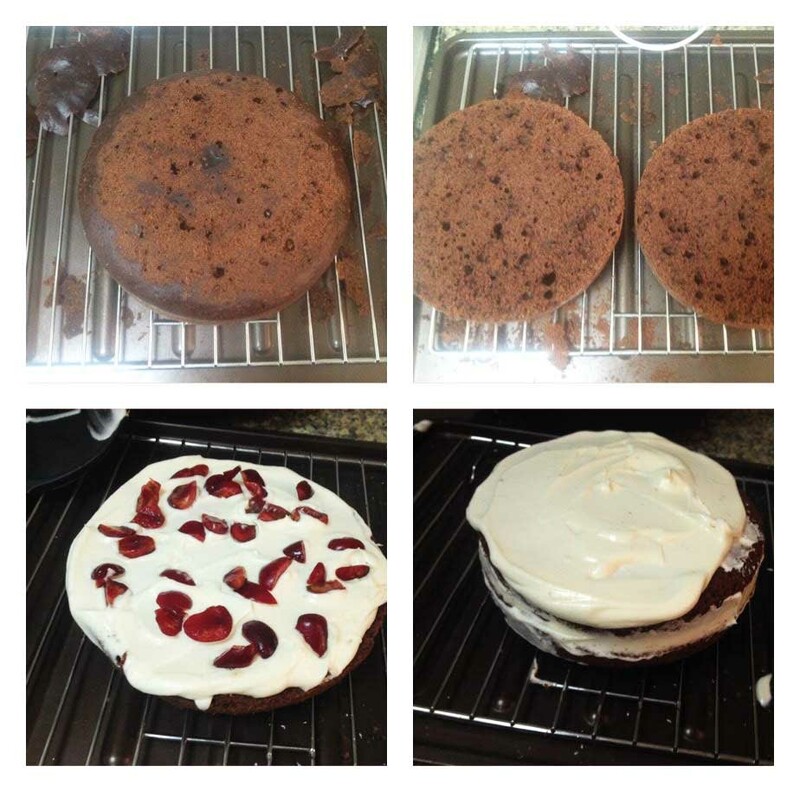 Here is the very easy, simple cake recipe which can be made in an oven, or on a stove top without an oven. Now let's see how to bake black forest cake without an oven. 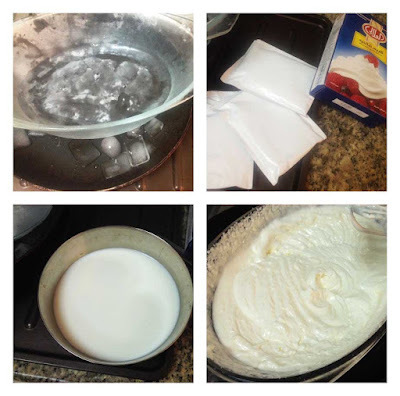 It is always best to prepare the cream for frosting ahead of time and refrigerate it until u prepare the cake. So that the frosting will stay for long. But i just made it only after my cake is done. So don't worry. So let's start with making whipping cream. For that, keep the mixing bowl, wire whiskers and hand whiskers in the freezer for 20 - 30 minutes. Keep some ice cubes in the freezer for placing it under the bowl which is used for making the icing. If everything set, take the chilled bowl. Set some small ice cubes in a tray under the glass bowl. Add 3 sachet of whipping powder, one and a half cup of cold milk. Whisk with electric whiskers until soft peaks formed(3 minutes). Do not beat more as it will turn to butter. If u need more sweetness, u can add some icing sugar also. You can also put them in a blender/juicer until soft peaks come out ( this can be done by whisking for 2 minutes using hand whisker then refrigerate and then put in a blender ). Grease the baking tray with butter, dust with flour and remove the excess flour. Beat the eggs and powdered sugar in a blender or using an electric whisker. ( i used blender). When done pour it into a big bowl. Now add oil to this mixture and whisk well till soft. 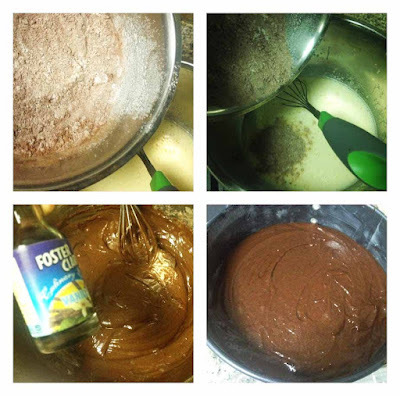 Sift together all-purpose flour, cocoa powder, baking soda and baking powder well. Add this sifted powders little by little to the egg mixture and keep on mixing until the whole flour is mixed up with the egg mixture. Add vanilla essence and mix well. Pour this mixture into the greased tray. The mixture should only cover the half of the baking pan as when it starts to cook, the mixture will rise. Heat a non-stick vessel with lid. When hot, make the flame medium low and keep the cake pan inside it and close the lid. Cook for 35 to 40 minutes in a medium low flame. Allow it to cool (for an hour) and then divide it into two thin cake layers. Set aside separately. Level the top and sides of the cake. You can use this crumbs for garnishing the sides of the cake. Start the icing, once your cake is completely cooled. 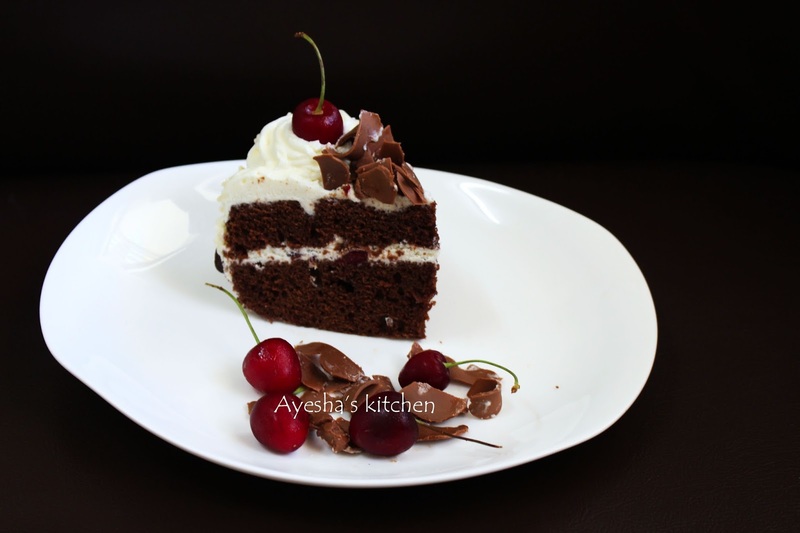 Spread some whipped cream over one layer, add some chopped cherries and cover it with the other layer. Spread the whipped cream thickly over the whole cake. The cake must look white in color. Add some whipped cream into a piping bag and make your own designs. Put some chocolate shavings in the center and sprinkle cake crumbs, vanilla vermicelli on the sides. Top with fresh cherry.